In the early 1960s, Britten forged several Soviet friendships. His first encounter with Mstislav Rostropovich was in September 1960, backstage after a concert at the Royal Festival Hall in London. The cellist had just given the London premiere of Shostakovich's First Cello Concerto, and the Soviet composer introduced Britten to the performer. The rest is history. As the friendship developed, Rostropovich's charismatic personality was to work its charms, and Britten's creative instincts responded accordingly. In the next decade came a Cello Sonata, a Cello Symphony and, finally, three Cello Suites. The omens appear favourable from the outset with the rich, burnished double-stops which herald in the Canto Primo of the First Suite. I admire the way in which Boutin contrasts the characters of the subsequent Cantos. The Fuga is invested with a skittish quality. In the Lamento, she paints a desolate and dark landscape, and this doleful quality spills over into the Canto Secondo. The pizzicatos of the Serenata are vibrant and truly resonate, and the Marcia is delivered with a wealth of tonal lustre. In the Canto Terzo the darker recesses are explored, and a sense of mystery informs the Bordone. Finally, Boutin meets the virtuosic demands of the Moto perpetuo with deft skill and accomplishment. Boutin's Declamato, which opens the Second Suite, is a heartfelt narration, spontaneously improvised, with the Scherzo suitably trenchant. She is particularly successful in the Andante which follows. The haunting, ghostly melody with pizzicato accompaniment is built up from nothing to striking potency and then back to silence. The Ciaccona carries the most emotional weight of the movements, and she contours the ebb and flow of its undulating narrative with a true sense of style and formidable communicative power. The Third Suite is an intensely personal reading. Boutin traverses the changing moods with profound insight and instinctive understanding. The Suite consists of ten thematically connected movements, resembling a set of variations. Russian folksongs and Eastern Orthodox liturgy permeate the score. These are glimpsed at throughout and presented in their full finery at the end. In Boutin's hands the music is allowed to unfold naturally. There is a profound resignation in the opening Lento, and the Marcia which follows is crisply articulated. In the Canto and Barcarola there is a deep-seated anguish. The Fantastico is mercurial and the Moto perpetuo capricious. The Passacaglia is fervidly passionate, leading into an intensely declaimed Mournful Song. The Suites have been well-served on CD. Recordings I have particularly enjoyed have been by Tim Hugh, Truls Mørk, Jamie Walton and Pieter Wispelwey. Sadly, Rostropovich only recorded the first two Suites. 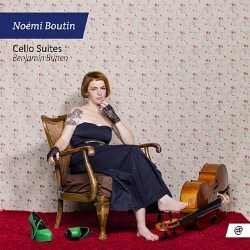 Noémi Boutin’s latest version is equally impressive, and one that I will most certainly be returning to. Her rich cello tone has been warmly captured in this vivid and immediate recording.